Everyone is aware that culture plays a huge role in how we view the world, but culture is like the water a fish swims in, or like the air we breathe. We often are not even aware of how important it is to us, and how it inexorably shapes the way we view the world, people, money, finances, community, leadership and nearly everything else. Alan Riding in the forward to his book Distant Neighbors, a short primer to Mexican-American interaction, writes this: “Probably nowhere in the world do two countries as different as Mexico and the United States live side by side.” I would agree. Think about the world and the boundaries that countries share. In most cases there are common or at least similar historical and ethnic elements. But Mexico and the United States are unique. The represent radically different cosmovisions, tracing back to how the two countries were founded, what conditions existed before European colonization and nearly diametrically opposed religious and political priorities. I have personally had to adapt to much of this, of course, having lived in Mexico now for 25 years, and even more significantly, having married my beautiful Mexican bride. I am, as close as anyone can be, an outsider with an insider’s cultural privilege. But I continue to learn about culture, and indeed it has been our children who have brought certain cultural differences into laser focus. I thought I understood before, but now I realize I really didn’t. Understanding culture is like trying to untie and almost impossibly knotted rope, or like playing Jenga…take one piece out, and the whole structure can fall down. The way we view accomplishments influences how we view relationships, and vice-versa. Our perceptions of community and friendship impact how we relate to one another, what we say or don’t say, what is considered acceptable or offensive. I could give a bunch of illustrations, but I’ll start with two. During our last days in Pennsylvania, I took son David to the dentist, but decided to go to a local café instead of waiting in a sterile dentist office. I happened to be in line behind three leaders of a local church that supports us. We exchanged pleasantries, and they went and had their meeting. They were surprised to see me, and were friendly, but our meeting was unexpected, and we all had things to do, items to discuss. But alas, I am more Mexican now. I imagined how that chance meeting would have been different in Mexico. I would have gotten hugged, enthusiastically greeted and invited to their table. They would have asked if they could buy me coffee, or a sandwich, or something else, anything I may have wanted. They would have inquired about our upcoming trip to Mexico. They would have suspended their agenda for me…in Mexico. But in the U.S., I was simply an unexpected encounter. A positive moment, but nothing more. After all, we all have important matters to discuss. Fast forward several days. We have now arrived in Mexico, to our home that needs services reconnected and needs cleaned up. Suitcases are still half unpacked. We are weary, really, still trying to recover from our 2600 mile trip. 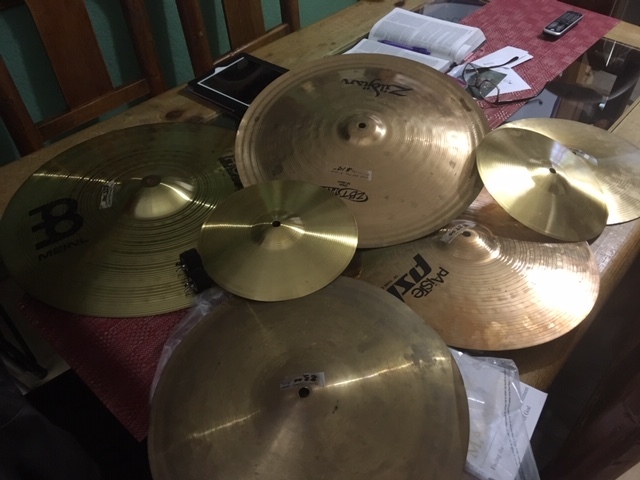 I purchased a bunch of used drum cymbals while in PA, and let the guy in charge of the worship group in one of the churches here know. Would he want to stop by and pick them up? I arrived home around 10 p.m. after taking my son and a bunch of friends to a soccer game. The worship leader was at our house, along with his wife and two small children, both under 5. We greeting one another affectionately…then realized that we should probably invite them for something to eat. Let’s go get tacos! So at around 11 p.m., we went and brought 25 tacos (suadero, pastor, tripa) back to the house. Coke too, of course. The couple stayed to a bit after midnight. They took their time in leaving, and we did not in any way imply that we needed to rest (we did!). In the U.S., we think about our hosts, their needs, and we don’t want to inconvenience them or overstay our welcome. That simply is not a part of the culture here…indeed, the biggest offense one can commit is to encourage guests to leave. Hopefully as you read these two stories you sense some cultural discomfort. I certainly did! The point, however, is not that one culture is right and another is wrong. No. They are just very different. What is often considered acceptable and normal in one culture can be viewed as odd or even rude in another. Obviously culture and cultural differences have huge implications for missions, both long term ministry and short-term missions experiences. May God grant us the grace and humility to learn how to share the good news of the gospel in culturally appropriate ways. Wow! Lessons I have been learning, for sure! I appreciate you sharing this so much, it is so true. Until you live it you can realize the huge difference in cultures, and only with God’s grace love both sides!